As the industry transitions to value-based care, healthcare organizations are striving to develop programs and solutions to find success in the new environment. Patient and Family Advisory Councils (PFAC) are one of the front-runners. If implemented properly, these councils can have a great impact on the overall effectiveness of a healthcare organization by improving HCAHPS scores, reputation, quality, and safety. However, advisory councils vary in effectiveness from organization to organization. One success story is Elmhurst Hospital in Illinois. Since 2009, the organization has leveraged their advisory council and created meaningful solutions by forming a diverse council and maintaining support from hospital leaders. Based on the group’s feedback, Elmhurst has built a new hospital campus, achieved Planetree designation, and continuously improves policies, procedures, and processes. 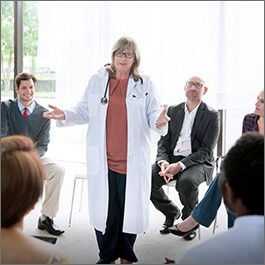 Join Joanne Muzzey, Director of Patient Advocacy and Planetree at Elmhurst, as she addresses how Elmhurst successfully created and upholds a highly effective advisory council, and how you could implement these strategies in your organization.